Contrary to everything Wallace & Gromit taught you, the moon is not made of cheese. The giant thing is actually encapsulated in a crust made of liquid molten iron, which may sound less enticing than white cheddar, but apparently, space nerds beg to differ. Sotheby's, known for auctioning off precious works of art for obscene amounts of money, is now offering the public a set of three space pebbles collected from a 1970s Soviet expedition, expected to sell for somewhere between $700,000 and $1 million. So, if you have some laundered cash you want to get rid of, and you love pebbles, Sotheby's has just the deal for you. These particular moon rocks, which will officially hit the auction block on November 25, are not on the market for the first time. Soviet government officials originally offered the pebbles up as a gift to the widow of a particularly esteemed Russian rocket scientist, trickling over to an auction block in 1993, where they sold for a measly $442,500, Gizmodo reports. Now, the precious moon shavings are back in Sotheby's capable hands, and they're worth even more because they are vintage rocks. Naturally, these aren't the only moon rocks to grace Planet Earth with their presence -- NASA has gifted space pebbles to a number of government officials and confidantes over the years. This is not unlike receiving coal in your stocking, but it's very expensive NASA coal, so it should not be taken as a sign that you were bad this year. "It was the first time a piece of another world had ever been offered for sale to the public," the Sotheby's listing claims. 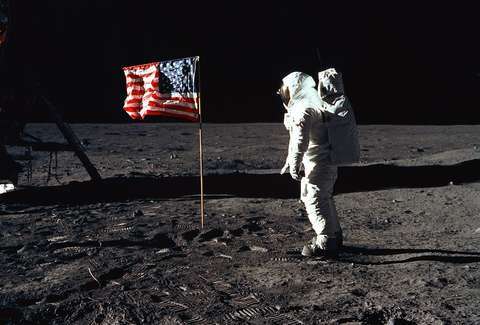 "It remains to this day, the only known legal sale of moon rocks to have ever occurred. We look forward to once again offering this tremendously rare and historic artifact to the public." Fortunately, if moon rocks aren't your thing, there are a number of other equally fun and useless space-centric items on offer. Consider dropping around $40,000 on a Soviet voice recorder employed in 1963 during the first space mission with a female astronaut. Or better yet, spring for a complete Gemini space suit (helmet included) for just $150,000. There are only 364 days left until next Halloween so if you're interesting in dressing as a space cadet or Lady Gaga in 2009, you'll be good to go. That said, the suit also makes for an excellent everyday statement piece if you happen to live in a particularly hip part of Brooklyn. If your disposable income doesn't leave room for the purchase of million dollar rocks from outer space, stop by the auction anyway, admire the ephemera from afar, and get a whiff of that sweet, sweet moon dust. Try not to be distracted by the fact that moon rocks sounds like a street name for cocaine.